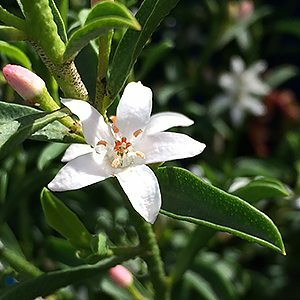 Philotheca myoporoides - The Wax Flower | Nurseries Online. Commonly called ‘Wax Flowers’ Philotheca myoporoides are related to Boronia and were previously known as Eriostemon myoporoides. Grown for the attractive flowers and easy to grow in a range of soil conditions some varieties are now being offered as cultivars. Look for these if you must, however the species themselves are attractive enough to warrant attention. The flowers do look a little like Daphne flowers, so sometimes they are called the Native Daphne. Some varieties are more upright that others, and even the species P. myoporoides comes in a long leafed and a short leafed form. The species Philotheca myoporoides (syn Eriostemon myoporoides) is one of the most widely grown in gardens. This is an evergreen native shrub also known as the long-leaf wax flower plant (see picture right). Sometimes called the Native Daphne, it is the foliage that gives the citrus like fragrance, however flower may be ‘Daphne Like’ in appearance. Reaching around 1.5m depending on conditions this is a drought tolerant plant well suited to full sun. In requires a well drained soil and is relatively care free. Used as a low hedging plant or as a feature plant it can be grown in containers. All species require a well drained soil and a semi shaded position. Watch for P. buxifolius ‘Cascade Of Stars’, great for embankments and covering retaining walls. Once established they are remarkably drought tolerant and easy care, however some water through the first summer is advisable, in very dry periods the occasional deep watering will enhance flowering. Prune lightly after flowering to maintain a bushy habit. 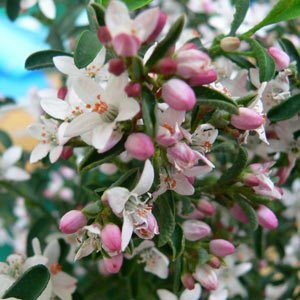 Common Names – Wax Flower and Long Leafed Wax Flower, also Native Daphne. Position – Full sun to a little shade. Soil – Well drained humus rich. Flowers – Pink buds opening to white. Flowering time – Spring to summer, spot flowering though to autumn. Height – To around 1 metre in height. Spread – Will spread to around 1 metre. Frost tolerant – Yes once established. Drought tolerant – Yes, once established. Philotheca verrucosus is the ‘Bendigo wax flower’. BRENLISSA FUCHSIA NURSERY -PH 0438393578. We offer over 245 varieties of Fuchsia, tubestock, pots, baskets and standards. Mail order specialists. Open 7 days by appointment. "Guaranteed mail order flowering bulbs, perennials, roses, trees, landscaping plants, garden accessories and community fundraising Austra lia-wide."